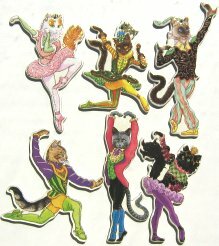 Here is a package of 6 ballet cats Christmas ornaments. The ornaments are printed in full color with gold accents. They are printed on both sides of antiqued cardboard. Gold cord included. The ornaments average 4" high x 1 3/4" wide.